Recently, a new book by pianist Susan Tomes (published by the company where I work) was reviewed in a prestigious classical music magazine. 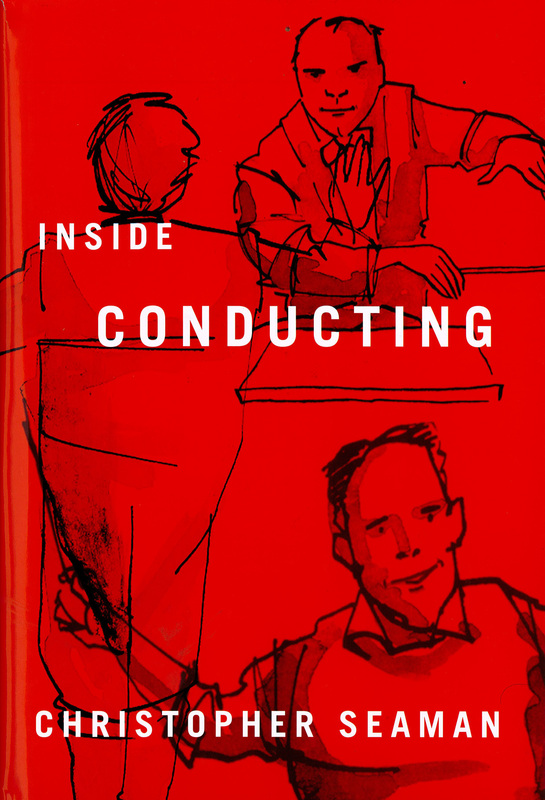 “[The author] is now in her mid-sixties but her tone of voice is that of a much younger person – inquisitive, energetic, entrepreneurial and gently provocative” wrote the reviewer. Personally, as someone much of an age with Ms Tomes, I hope that the day that I’m no longer inquisitive is the day that I’m no longer breathing. For people like me, the notion that old age is a time to dial it down and play it safe is a cop-out. Those of us who are able should be raising hell on behalf of whatever we care about. PJP has a few years on both Susan Tomes and me, and his spirit and joy in the wonders of everyday life as he approaches 80 are inspiring. He’s the sort of person you’d like to shuffle up close to, hoping that by standing next to him you could see the world as he sees it. Then, earlier today, driving around Rochester, NY, I heard a programme on public radio about older people who’d picked up the thread of their creative activities – or started something completely new – after a long break. There were storytellers, stand-up comedians, painters and musicians (“I’m supposedly too old to rock,” said one, “but I’m too young to die”): one had given up art to found a business but discovered her life was lacking something without the smell of linseed in her nostrils. What all had in common was the sense of relief in their voices that they’d returned to “whatever [they] care about”. Certainly that business was important, they’d enjoyed fulfilling careers, but it was the sound of an electric guitar being tuned or that first mark on a blank canvas that was truly important, the thing that fed their souls. I’ve nothing against the young, of course, but I resent the idea that anyone over 50 should put on a cardigan and dispense toffees to grandchildren and leave life to others. If you can’t be “inquisitive, energetic, entrepreneurial and gently provocative” when you’re older there is something clearly amiss. In fact, the young and the old share a great deal: when you’re young you think you have a whole lifetime ahead of you so why not try something new? In later years, there’s a feeling that if I don’t do it now, I never will. Certainly in my own personal, professional and creative lives I’ve come to relish the leap into the unknown, the heady feeling of free-fall, the rush of adrenaline that comes with a sudden turn away from the expected or the familiar. The image at the top of this post is a collage. 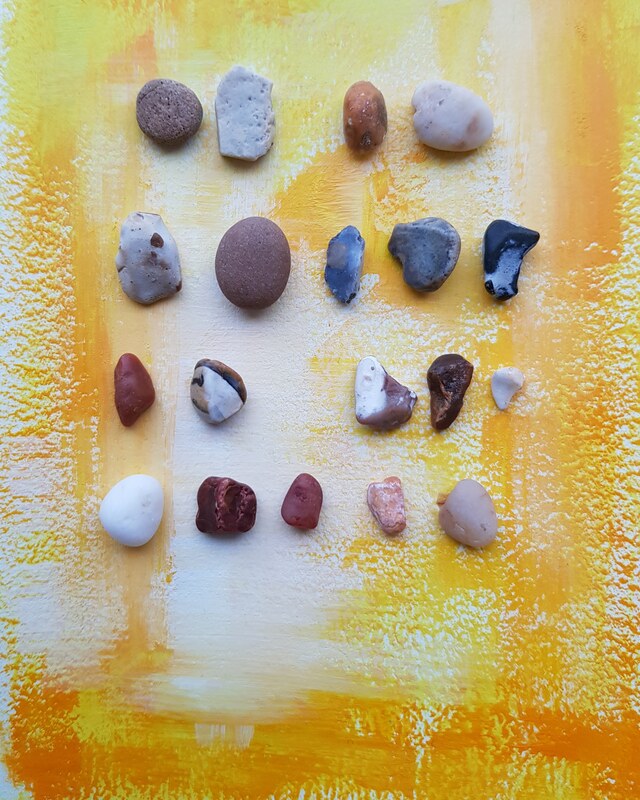 I had a yellowy-orange sheet of paper ready to work up into something, and then scooped up a handful of pebbles from the beach which, I thought, looked like hieroglyphics when laid side by side. It seemed to capture something of the intrigue of a language that I don’t know. There are a number of places which, when you’re there, you never want to leave. The cool marble and tinkling fountains of the Alhambra; Rome, where Henry James’ greatest heroine ‘dropped her secret sadness into the silence of lonely places where its very modern quality detached itself and grew objective’; New York City in winter, looking out at the snow-filled garden of the Frick mansion from a room hung with Rembrandts. On a different scale, I’d now add Great Blasket Island off the western coast of Eire. Uninhabited since the early 1950s and dotted with tiny stone cottages in various states of disrepair, the island is a place of enormous beauty and a gentle melancholy. Surrounded by the Atlantic with its ever-changing blues and greens, Great Blasket is virtually cut off from the Dingle peninsula during the winter months when the ocean becomes a fierce adversary. It was the winter isolation with a tragic consequence that finally drove its tiny population from this unlikely paradise. Some descendents of the Blasket Islanders are renovating and restoring the houses now. Walls are being rebuilt and roofs replaced and a hilltop cafe serves possibly the worst tea you’ll drink in Ireland. In the early years of the last century a number of inhabitants wrote books about their experiences living here which I’m sure are well worth reading, but you don’t really need to. Just walk down to the beach with its pungent, lolling seals and look out across the ocean which, even on a peaceful summer’s day, peaks and troughs around the coastline. Between you and America there’s nothing but these temperamental waters, stretching away for over 6,000 kilometers. Put yourself in the shoes of those Islanders living on lobster and rabbit and burning peat for warmth; imagine writing your stories or tuning your fiddle by candlelight, a winter storm thrashing at your windows and around your thatched roof. Consider all of that and tell me this isn’t a paradise of sorts where things detach themselves and grow objective. I’ve been involved in making collages lately, using cut-up pieces of unwanted paintings, as a sort of palate cleanser (apologies, there was no way to avoid the pun) before beginning the task of rethinking the way I paint. There’s something satisfying about finding those corners where a brush stroke takes on true character or a line of charcoal intersects a block of pigment in an exciting way. Building those pieces up into something new is such a thrill. This particular one tries to evoke that feeling of walking to the sea along a lonely cliff path. My heartfelt thanks to SO’R, PM, SB and IB for making it possible for me to visit Great Blasket last weekend. Socks. Jockeys. A string vest. that set us light years apart. What did we have when we undressed? 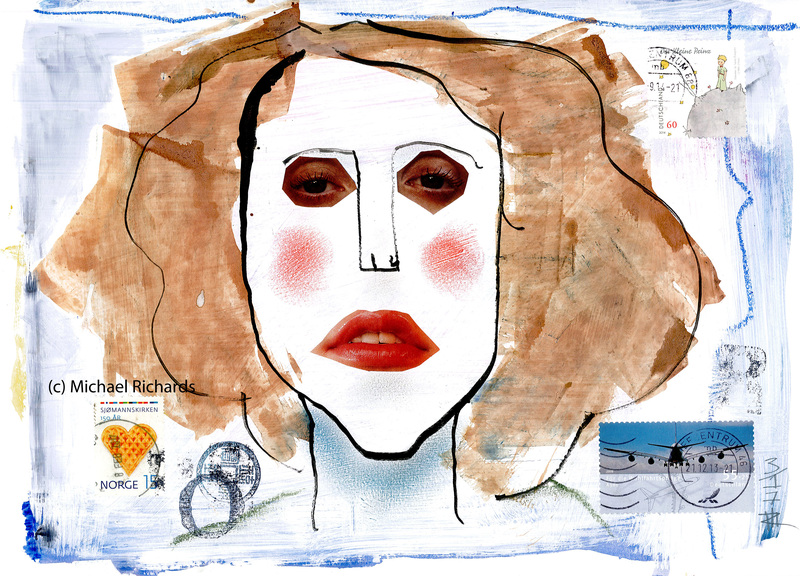 Inspired by the illustrations of John Cuneo, this collage features a certain type of man: you know him – he holds all sorts of opinions about how a woman should look but allows himself different standards. He has money, thanks to a business that owes its success to never underestimating the ability of the buying public to pay over the odds for something they don’t need. Unfair employment contracts meant that he didn’t have to worry about taking care of his staff and provide him with money enough to treat himself to expensive suits, a red Z4 and an all-year tan. If only he’d paid more attention to his underwear. 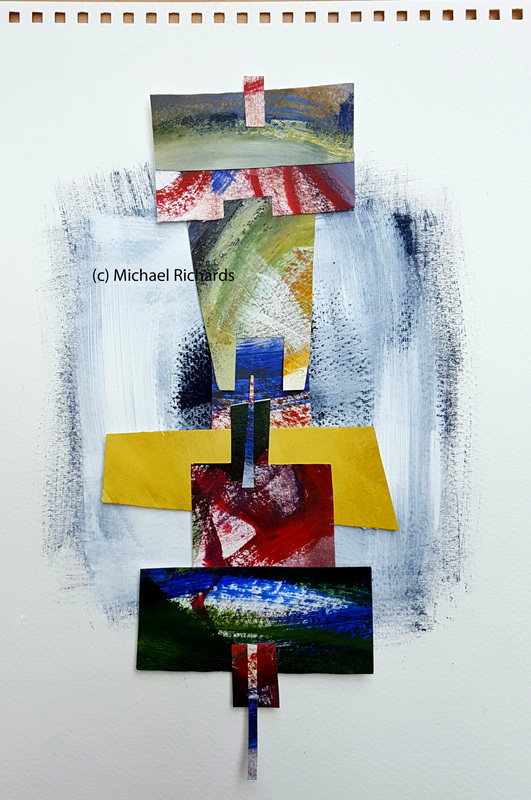 Author Michael Richards (certainline)Posted on April 4, 2017 Categories art, collage, drawing, illustration, ink, poetryTags art, collage, drawing, illustration, poetry7 Comments on Socks. Jockeys. A string vest. I dread people telling me their dreams. I never quite know how to react: of course they’re surreal and strange, they’re dreams – not reality. Where would the path have led us if we’d followed it to the very end? You, holding my hand as the sun rises over the tree tops, the start of a new day that I sensed we wouldn’t see through to its conclusion. Paper, a pencil, just a few lines before the effort became too great. A book face down on the floor. A telephone ringing somewhere deep inside the house. And the corners of the room are still dark as soot from smoking candles. What was the point of all those words, I wonder, if so many of them weren’t true? Your hair spread over the pillow, notes of blue and grey amongst the brown. We’d always assumed I’d be the first to leave. Birds sing like it’s any other day. A door slams. A car drives down the hill. I was pleased to wake at that point. Even now I’m not sure what was part of the dream and what rushed in to fill the gaps when I awoke. Later, in the morning sunlight the picture seemed less sinister: a pale-skinned woman thinking of past loves, travels and her childhood, nothing more unsettling than that. 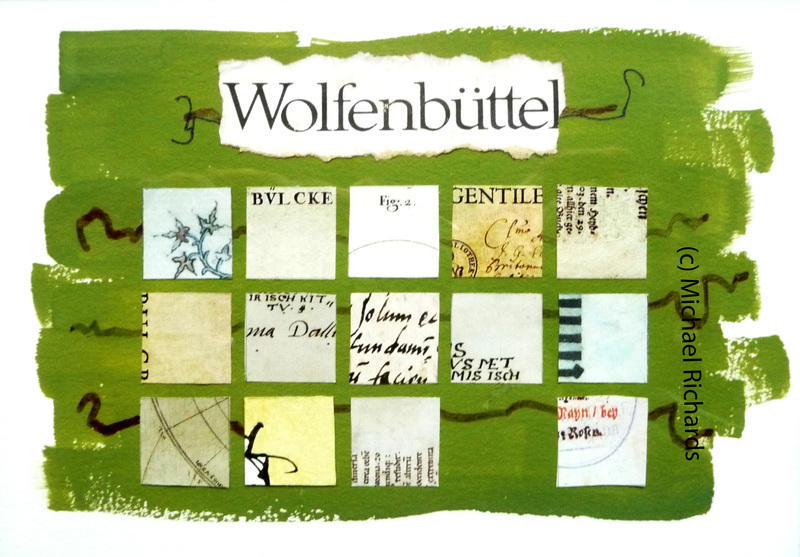 I am fascinated by, and have enormous respect for, the art of collage. It seems to me that you need to develop a different sort of ‘eye’ than that used in drawing or painting, an ability – perhaps – to have a better sense of the end result when you start than is often the case with a drawing. This one came together fairly fluently once I’d decided on the sort of shapes I wanted to use. Cut from one of the less successful paintings I competed on my recent Seawhite Studios course – a rather traditional still life with some interesting colour combinations and brushwork but otherwise a bit dull – the arrangement seemed to suggest itself from the painted marks within each shape. 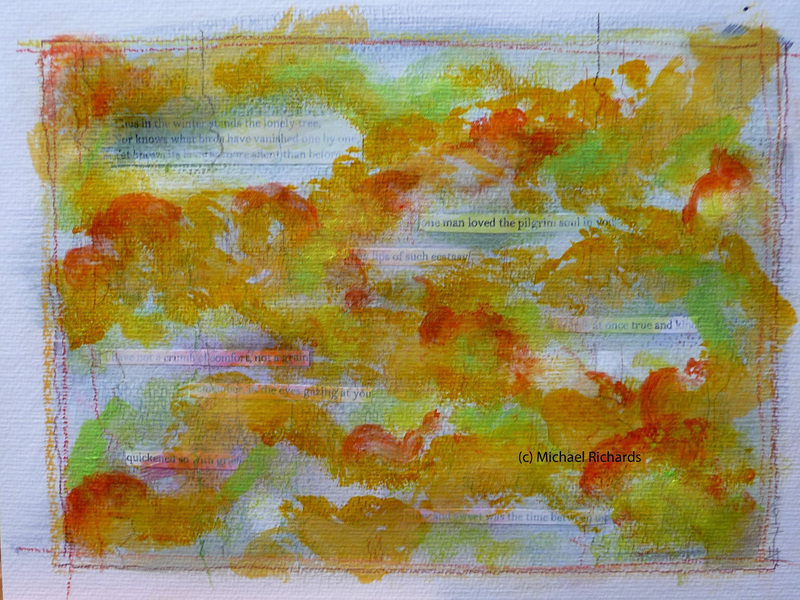 I like to listen to music when I draw or paint, usually modern classical music of a certain type – Morton Feldman, Gavin Bryars, Valentin Silvestrov, John Luther Adams – or ambient jazz such as Eberhard Weber or Jon Hassell. Just lately I’ve tried having pop music in the background, which is where this piece’s evocative title comes from. I have another – “All these broken pieces fit together to make a perfect picture of us” – which I’m looking forward to using when the image suggests. Well, it’s better than Untitled Collage # 4, isn’t it? I’m very grateful to Jean Messner for nominating me for a Blogger Recognition Award. I’m always very touched by these awards from other bloggers as they suggest that what one is doing resonates with someone enough for them to want to tell others. Jean’s own blog is an inspiring piece of work that not only describes her own artistic journey but also turns a spotlight onto artists she admires. I’ve listed some favourite blogs fairly recently, so let me direct you there and to the list on the right hand side of this post. Thank you, Jean, your nomination is much appreciated. 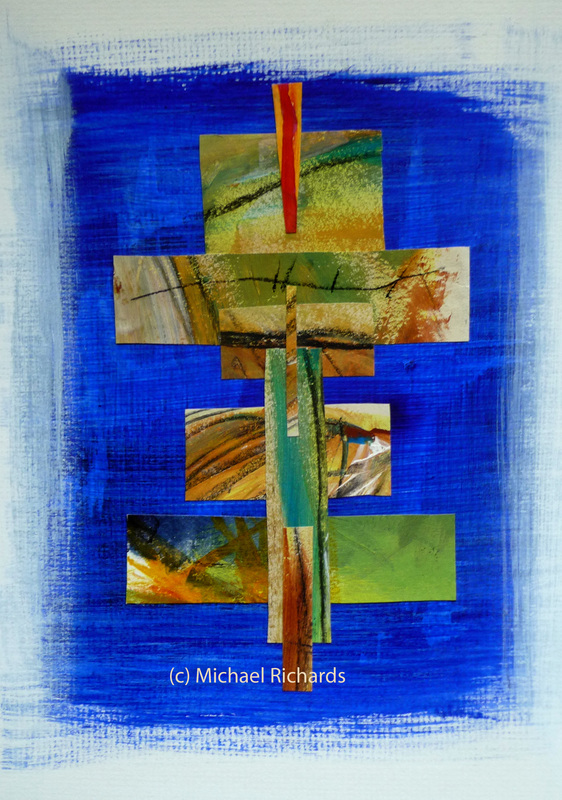 Here’s a picture which started life as an exercise in combining paint and collage. Taking its cue from the line about ‘the pilgrim soul’, the suggestion of landscape and a path through it was used to imply movement, an emotional journey from one place to another. It isn’t by any means a finished picture, but more a work in progress. I might even, as I learned to do in my Seawhite Studios workshop, paint over the whole thing and start again! 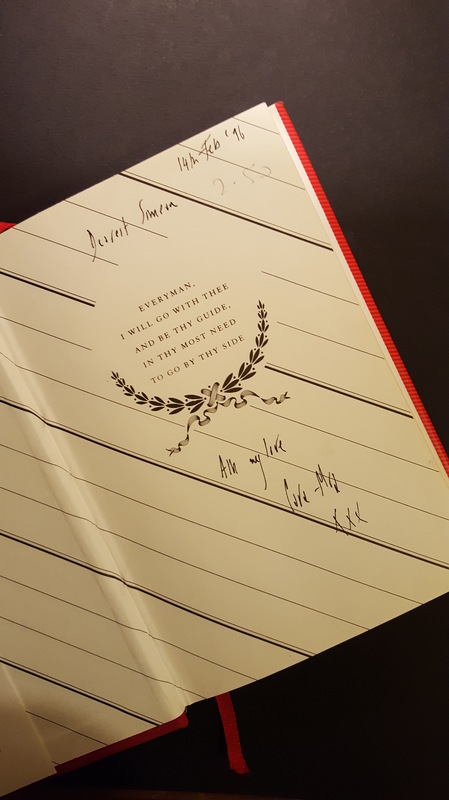 There could be a whole short story in the inscription, written inside the book (below). Note the date and wonder what happened to these two, and why her gift ended up among the reduced stock of an online book dealer. Let’s at least hope that the time between them was slow – and sweet. Poems by Edna St Vincent Millay, W.B. Yeats, C.P. Cavafy, Yehuda Amichai and Robert Graves. I admire artists who can handle collage with ease and assurance, especially those who combine it with drawing or painting. I stumbled on a wonderful Ralph Steadman retrospective at the Society of Illustrators in New York City last weekend, whose illustrations for Ambrose Bierce’s Devil’s Dictionary take the technique to an extraordinary level of invention. 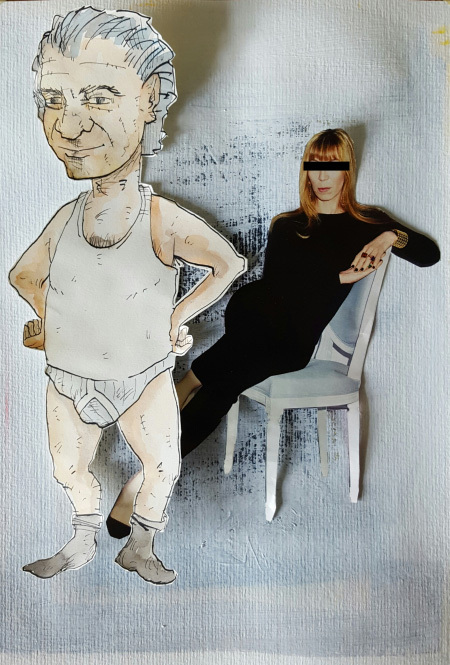 The acclaimed German illustrator, Christoph Niemann, has also developed his own way of combining drawing and collage in a series of photo-drawings. My own attempts have been infrequent and on a more modest scale. The example above is about ten years old and based on a simple grid pattern. The material was ‘borrowed’ largely from the annual report of the Herzog August library in Wolfenbüttel along with some other medieval and one or two more modern pieces. I was so pleased with it because within the grid there is a rough ellipse created either by the outside or the underside of each piece. Why is it called The Imposter? Because one piece is different from the rest, yet it tries to pass itself off as if it belongs.